Autoduel was a racing/RPG based on the Steve Jackson Games pencil-and-paper RPG Car Wars, a vaguely Mad Max-ish game about heavily-armed vehicles doing battle in a post-apocalyptic America. 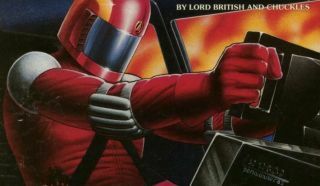 The computer version was developed by the long-defunct Origin Systems and released all the way back in 1988. And now, if a trademark filing dug up by the RPG Codex is to be believed, it may be on the way back. The filing, which was actually made back in July, is for "providing online downloadable computer and video game programs; Interactive video game programs," with the applicant listed as inXile Entertainment Inc. That doesn't necessarily mean much—trademark filings are easy enough to fake, as we know—but inXile founder Brian Fargo gave the find some legitimacy by retweeting an image of the filing with the comment, "Once again the Codex is first on the scene." The Fargo connection to Autoduel isn't as obvious as it is with games like Wasteland 2 or The Bard's Tale 4, but it is there. Origin Systems was founded in 1983 by Richard Garriott (and others, including his brother Robert, but Richard is the one everybody knows) and acquired by Electronic Arts in 1992; Electronic Arts just happens to be the publisher of the original Wasteland and the original Bard's Tale trilogy. It's a tenuous link, but given the success inXile has had with Wasteland 2 and the widespread interest in other old-school resurrections—especially RPGs—it's not unreasonable to think that EA would give him a shot at a franchise that hasn't been touched for decades. InXile said it had no comment beyond Fargo's tweet, which isn't surprising but still a bit disappointing. We'll keep you posted. In the meantime, don't miss our recent chat with Brian Fargo about Wasteland 2, Fallout 4, and the different paths that lead to the end of the world.